Welcome to the Monsignor E. L. Grzybowski Council 7580 of the Knights of Columbus web site. We are now over 35 years old and still growing. 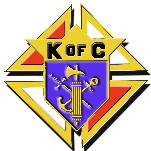 The Knights of Columbus was founded in New Haven, CT in 1882 by Father Michael J. McGivney, the Knights of Columbus provides members and their families with volunteer opportunities in service to the Catholic Church and community. It also offers them insurance, annuities and related products. The sale of insurance has been a part of the Order's program since its founding in 1882. The Knights of Columbus is a corporate sponsor of the Daily Point of Light Awards program, providing full funding for the program and the award presented each year to outstanding volunteers throughout the United States. Our council was formed in May of 1980 at St. Monica Parish in East Peoria, IL by the then pastor Msgr. Grzybowski and a group of parishoners led by Walt Schultz. The council was known as St. Monica Council. Walt was elected the first Grand Knight of the Council and served in that office for two years. With the help of Brother Joe W. Bush as membership director the council began to grow slowly and continues to grow. Nearly two years later Msgr. Grzybowski was killed in a tractor accident while working on the parish grounds. In June of that year new officers were elected and the first order of business was to change the name to honor our deceased pastor and chaplain. The Supreme Council graciously granted this request and we officially changed the name in the fraternal year of 1982-83. For more information about what we do please choose the area you are interested in above in the stacked menu to the right.